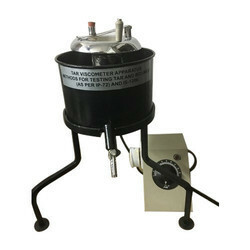 Tar viscometer apparatus as per IP-72 and IS 1206 standards. It is used for determination the viscosity of road oils and cut back bitumen. It consists s. S. Bath with cup of 10 mm or 4 mm orifice and sleeve, stirrer with lifting clip and ball. The assembly kept on suitable stand with leveling screws. Suitable to operate on 220 volts ac mains. It is used for determination the viscosity of road oils and cut back bitumen. It consists of 5.5 bath with cup of 10 mm or 4 mm orifice and sleeve, Stirrer with lifting clip and ball. The assembly kept on suitable stand. Suitable to operate on 220 Volts AC Mains. - It is used for determination the viscosity of road oils and cut back bitumen. - It consists of S.S bath with cup of 10 mm or 4 mm orifice (while ordering please orifice size) and sleeve, Stirrer with lifting clip and ball. - The assembly kept on suitable stand. Consist 6 cups in a S.S. Water Bath mounted on Stand with levelling feet & notched Strip for locating graduated cylinders. Fitted with 1000 watts immersion heater. Temperature is controlled by precision thermostate with F.H.P electric motor Stirrer. Supplied with Six Tar Cups either 10mm or 4 mm orifice with Valves. 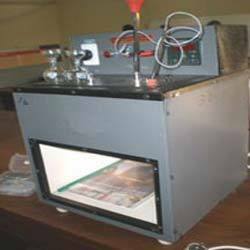 TAR VISCOMETER APPARATUS As per IP 72 and is 1206 standards. It is used for determination the viscosity of road oils and cut back bitumen. It consists S.S. Bath with cup of 10 mm or 4mm orifice and sleeve, Stirrer with lifting clip and ball. The assembly kept on Suitable stand with levelling Screws. Suitable to operate on 220 Volts AC Mains.